Leaving out those great ones who have cut their niches in history, (the history of this country is rich in fore-runners of Anarchism) such as Godwin Shelley, and Owen, I propose to place on record some of the lesser known pioneers of the Anarchist movement. Of those of a proletarian origin, Dan Chatterton stands out as one who attracted most attention. 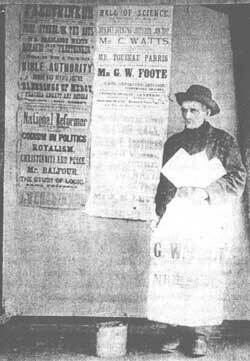 In front of me as I write, is a cabinet photo of this tattle spare old man, who, in his day, was so well known in the parks, and every part of London where there were meetings of any section of the advanced movement. There he was, selling the current issues 'Freedom' and 'Commonweal', especially pushing the sale of his own tattle production 'Chatteron's Atheistic, Communistic, Scorcher'. (A full set is in the British Museum.) He usually created both sensation and amusement by rapidly announcing his paper as "an appeal to the half-starved, herring-gutted, poverty-stricken, parish-damned, inhabitants of this dis-united kingdom!" This paper appeared in pamphlet form, whenever possible, in various kinds of type, and on varying kinds of paper. Through it ran his 'Auto-biography of old Chat' which is a history of the struggles of his time, and his frequent challenges to the Bishops and priests to debate. Mrs Beatrice Webb (Lady Passmore), in her book 'The Story of My Apprenticeship", states that when she was rent-collecting under Mrs Olivia Hill in the Drury Lame district, Chatterton was one of her tenants. She says that he was reputed to have collected his type from printers' dustbins, which he set up on his kitchen table, and his wife sat on the formes, in order to get an impression; for he had no machine. Richard Whiting, in his once famous novel "No 5 John Street", makes Chatterton one of his leading characters, under the nom de plume of "Old 48", and says of his journal - 'This journal, if I may be pardoned the digression, has no circulation, yet it supports "48", as he supports it. It is bought as a curiosity at public meetings and usually by persons who have in view an inexpensive donation to the British Museum. Many who buy it make the transaction an excuse for offering the proprietor an alms. It has every note of singularity. It is printed on paper of a texture generally used for posters, and of the hue of anaemic blood. Its orthography is that of the first standard, its syntax aspires to the perfect freedom of the Anarchist ideal. Its is set up from a composite fount, suggestive of a printer's dustbin, and containing so undue a proportion of capitals that sometimes they have to take service out of their turn at the end of a word. "It might appear to have a large staff for no two of its articles are signed by the same name. "Brutus" writes the leader, "George Washington" supplies the reports of meetings; "'William Tell" supplies reminiscences of the Chartist rising and "Cromwell" acts as agent for advertisements. To the untutored, however, these are but so many incarnations of one commanding personality. When "48" has written the entire number, he sets it up, and carries it to a hand printing press which Gutenburg would have considered crude. When the press happens to be in a good humour, he obtains a copy by the ordinary method. When it does not, he is still at no loss, for he lays the formes on the table, and prints each sheet by pressure of the hand. Earlier difficulties of this sort were met by the co-operation of his wife, now deceased. This devoted woman sat on the formes, and obtained the desired results by the impact of a mass of corpulency estimated at fourteen stone. Her death is said to have been accelerated by a sudden demand for an entire edition of a hundred and seventy copies descriptive of a riot in Hyde Park. These earlier copies are valued by collectors for the extreme sharpness of the impression." John Henry Mackay, the German Anarchist poet, wrote a novel of the London Socialist movement of the '80's called "The Anarchists", in which there is a very good pen-picture of Chatterton. "Chatterton, always of the poor, was always for the poor, and never shirked the fight. Original, and strong in character, he fought all his life for his class. Individualistic in temperament he believed that it was only in Communism that he could find liberty. A militant Atheist, he was too logical to reject a government in the skies and accept one on earth. He fought the politician as he fought the priest, for, as he often said 'They were twin vultures hatched from the same rotten egg.'"